Are you curious what the NN Traineeship is like? Watch the video and get inspired by our trainees. They will tell you more about the traineeship and how it is to work at NN. 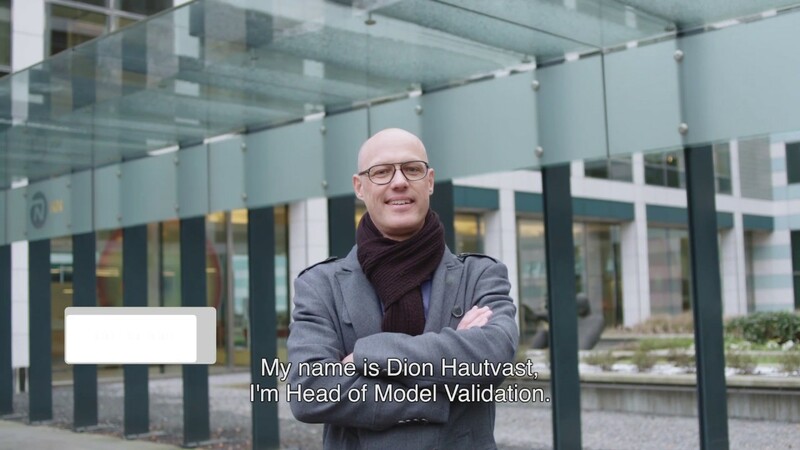 Dion Hautvast and his team are responsible for Model Validation within NN. In this video Dion tells us about the challenges and his experiences in working at NN. On 15 and 16 November, the NN International Hackathon united 200 colleagues in The Hague. For 24 hours, the teams learned together, worked together and had fun together. Watch the video and experience the energy and atmosphere of the event. Are you curious what it is like to work at NN as a IT Specialist? Watch the video and get inspired by our colleagues. They will tell you more about working at IT Nationale-Nederlanden Non-life. Arun Sivaramakrishnan, Head of Performance & Analytics and Derk-Jan Stol, Head of Group Finance & Reporting, talk about the challenges NN Finance is facing, and why it is so interesting to work for NN in an ever changing world. Are you wondering what it's like to work as an IT Risk Manager at NN? Watch the vlog below in which colleague Alexander takes you during one of his working days at NN. Risk Management is indispensable to our business and to the quality of our services. Guus Schoorlemmer, Head of Risk Oversight at NN Group talks about the vision of NN Risk: ‘We keep the company safe’. Watch the video and find out more. IT is essential for the growth of our company and for the quality of our services. Watch the video below in which colleagues Leon Kortekaas and Femke Jacobs tell us what IT means at NN.